Researchers from the University of Perugia in Italy, in collaboration with Turkey's Grafen, discovered a simple method to fabricate graphene-based printed electronics, using an ordinary cellulose paper and pen. This process, if they manage to commercialize and automate it, could enable cheap flexible biodegradable electronics. The researchers started with graphene nano-platelets (made by Grafen). These were drop-casted these onto ordinary glossy photopaper as a transfer substrate. 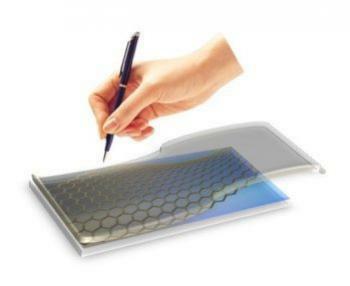 The breakthrough process is that the paper was sandwiched between two rough paper sheets and then, using a simple ballpoint pen, the researchers drew patterns onto the backside of the graphene-coated glossy paper. The patterns were thus transferred onto the rough paper. The researchers say that the electrical conductivity of graphene line patterns fabricated in their experiments was excellent and those circuits survived after 500 cycles of folding. These patterns can be removed easily just by using an eraser! How about a link to a published article? I don't have one, I got the PR by mail but didn't find the original article. This method of obtaining nano-scale sheets was reported by A.Mailian, M.Mailian, G.Shmavonyan in July 2013, at Nanotexnology 2013 conference, Thessaloniki, Greece . See Absract Book, p.53 and 280.